You are going to ask: where are the lilacs? We bought a house in 2012. 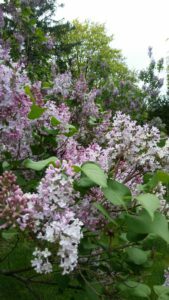 About five weeks after moving in, the seven lilac trees on the eastern border of the property bloomed and filled the afternoon and evening air with their powerful fragrance. It was both presently wonderful and jarringly nostalgic. I instantly remembered the last time I had noticed lilacs. 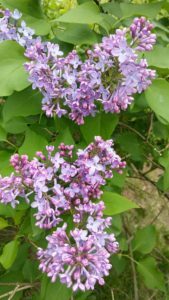 There were three huge lilac trees on my grandmother’s property that sat about 15 feet in front of the back door (there may have been more, but three stick out). The three lilacs formed an imposing wall, behind which reigned several large apple and pear trees. 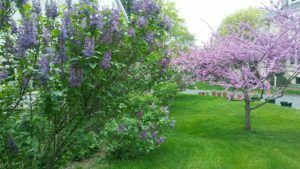 There was a four and half foot hole that was between two of the lilacs – it was about five feet deep and it made a perfect pathway for children to the greater lawn and our favorite apple tree. The second photo shown here is from when I was five or six years old. 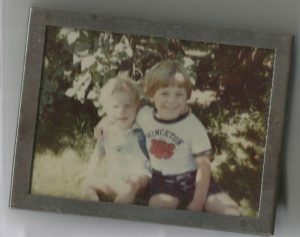 It was taken in front of the base of one of the lilac trees (I regret the Princeton shirt, but my parents didn’t know any Rutgers alumni in 1982). I was raised to revere Lincoln (my parents didn’t have to push hard). I discovered Walt Whitman in a high school poetry class my junior year, and though “O Captain My Captain” is my preferred Whitman eulogy for our 16th President, I very much like “When Lilacs Last in the Dooryard Bloom’d” (it also reminds me of my father, who mentions it from time to time). When I was in college, I took an art history class (renaissance art to the present). It was all new and the tests were difficult. The professor encouraged us to take individual trips to the MET to look at various pieces. I fell hard for Claude Monet (there is a room in the Impressionist section that I have a sense of ownership for). Last spring, I traveled to Paris and spent a great deal of time in museums, particularly hunting down the works of Monet and Rodin. I saw this painting at the Musee D’Orsay (the fifth floor holds the distinction of being my world favorite, so far). Monet painted it in his garden at Argenteuil in 1872. 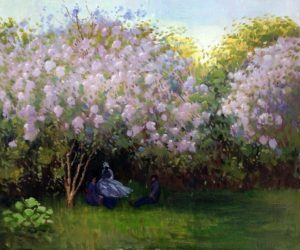 It is titled “Lilacs, Grey Weather” (there is also “Lilacs in the Sun” and it is housed in the Pushkin Museum in Moscow). I stared at it for a long time, both close up and at a distance of over 20 feet. When I returned to NJ, I bought a print of it and hung it in my kitchen so I could see it every day. When I taught high school English in Elizabeth, I discussed about 75 poems fairly in-depth. One of the poets that received repeat business was Pablo Neruda. His poem “I’m Explaining A Few Things” begins with the line “You are going to ask: and where are the lilacs?” It is devastating. Neruda is known for musing on love and nature. This poem is about the horrors of the Spanish Civil War, the destruction of Madrid and all the slaughtered children he saw. He mourns that markets of fruit & fish and the boxes of flowers that hung in Spanish windows. He cannot smell the lilacs due to the stench of gunpowder and the dead. It is a universal poem, and can be applied to current war torn regions around the world. I returned from military duty yesterday evening to find my lilacs in full bloom. I can think of nothing better to come home to in the Spring from Army duty, where I had to take a gas mask off in a gas chamber. The scent of lilacs versus the stinging of chemical warfare training adroitly sums up the dichotomy of my life. “Where are the lilacs?” indeed.